If one should think that politics is just politics and one's worldview has nothing to do with it, then he or she should consider the circumstances facing the people of Hatteras Island, North Carolina. 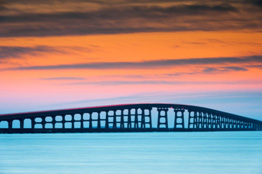 Tuesday, December 3rd, the Department of Transportation (DOT) in the state indefinitely closed the Herbert C. Bonner Bridge, which provides the only link the island has to the northern Outer Banks and the mainland. DOT officials said it was necessary to close the bridge because too much underwater scouring around the bridge's supports had made the bridge unsafe for travelers. State Transportation Secretary Tony Tata readily acknowledged the decision to shut down the connection "will have a devastating effect on the people who live along and visit the Outer Banks." Allen Burns, a Hatteras grocer serving on the Dare County Board of Commissioners, says the bridge closing will injure Christmas tourism business and cause residents hardship. Although Emergency ferry services will be employed, the process is most cumbersome and time consuming, significantly limiting travel in the area. The shame in all of this is that a new Bonner Bridge has been delayed for years because of legal wrangling with an environmental group, the Southern Environmental Law Center (SELC). The bridge, which was built in the early 60s, never had more than a 30-year lifespan, but the process to replace the structure started approximately twenty years ago. Environmentalists are saying the new bridge proposal would threaten coastal wildlife. In order to avoid any danger to the natural world, they propose building a seventeen mile bridge at more than a billion dollars to tax payers or use ferries. What precipitates such nonsense? It is one's worldview. Most people in North Carolina and the nation have been deeply impacted by a cultural Christian worldview, even though they may not know or acknowledge it. The Book of Genesis teaches that mankind is to '[b]e fruitful and multiply and fill the earth and subdue it and have dominion...over every living thing that moves on the earth" (Gen. 1:28). Jesus taught that human beings, made in the image of God, are of much more value than animals. On one occasion the Savior said, "Look at the birds of the air...Are you not of more value than they?" (Mt. 6:26). On another occasion, He demonstrably stated, "Of how much more value is a man than a sheep! (Mt. 12:12). The biblical worldview on the environment is that we should responsibly "subdue" (subjugate, restrain, control) and develop the earth and its natural resources in a way that best benefits the human race. Contrast the Christian worldview with the viewpoint of militant environmentalists and you'll see there's a divide wider than the Bonner Bridge. Many believe in "untouched nature" as their ideal. Thus they subvert building projects via lawsuits to protect some species of animal, bird, and even insect life. Some go so far as to argue the human population should be drastically scaled back to save the earth. The Bonner Bridge closing is a case in point as to how our worldview affects us for either good or bad. Moreover, it demonstrates that when some point of view other than a biblical worldview is granted supremacy in public-policy, it inevitably results in harm to God's crowning and most beloved creative achievement – man. Sen. Cook is right; the environmentalists in this case need to get out of the way. But they might consider an even greater reason for getting out of the way than the trouble they've caused the people of Hatteras Island. Much of the philosophy behind what they do stands as an obstruction to the purposes of God. 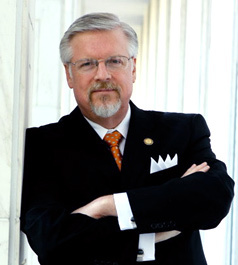 The author gratefully acknowledges that he has drawn from Wayne Grudem's, Politics: According to the Bible in stating the Christian worldview on the environment in this article.